Take to the super villain stricken streets of Gotham City in style and recreate the iconic look of DC Comics favourite caped crusader when you wear our men's superb Officially Licensed Grand Heritage Batman fancy dress costume inspired by The Dark Knight film series written by Christoper Nolan. This fantastically detailed superhero fancy dress comprises of a black spandex jumpsuit with molded armour chest piece, gold utility belt, a long flowing black satin cape and a pair of corresponding gloves with silver detailing. 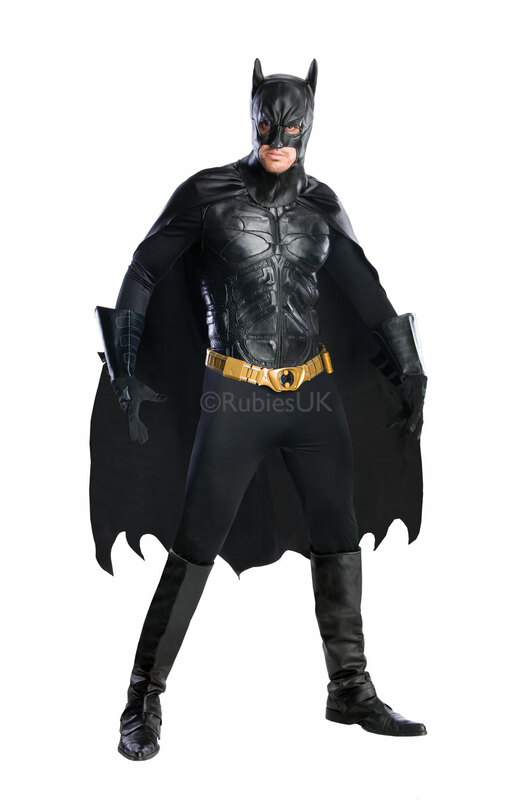 Completing this comic book costume is the instantly recognizable Batman leather look headpiece which fits over the head and has attached bat ears and a pair of matching boot tops which can be worn over the top of your normal shoes. Have hearts melting when you turn up wearing this quality costume to any Superhero, Comic Book or Film themed fancy dress party.